Forget infrastructure spending to boost our Nation's economy. We may have another federal election soon so we can spend another $300M on something useless. The next election may not take place immediately since we may get a Coalition Government but what would Parliament be like with the Conservatives in Opposition and with the new Government being forced to introduce its Budget quickly. Can you believe these people in Ottawa? Are they so completely out of touch with reality? The economy is falling apart and they are playing political games of chicken, seeign who will blink first! It is all about power not the well-being of Canada. Is our Prime Minister an infallible and brilliant political tactician or merely another Conservative Leader who has been outthought again by the Liberal strategists? Was it sheer arrogance on his part that the Liberals will use against him with voters so that they can form the next Government or a stupid poltical miscalculation as the Tories made under Joe Clark? While the Liberals may have thought that they might force an election after the budget in the spring, did Santa give them a Christmas present earlly? Will the Senior Liberals stop fighting each other to become the new Leader and grab the opportunity being presented to them even if it means holding their noses and supporting Dion one more time? Is Jean Chretien who is negotiating with Ed Broadbent of the NDP re a Coalition government really getting his revenge and will run the Canadian Government again but from the backrooms? Does Stephane Dion really think he is Pierre Trudea? Call it a very costly miscalculation. Joe Clark's minority government is facing a vote of confidence in the House of Commons two days after Finance Minister John Crosbie unveils his budget before Parliament. But the Liberals and the NDP aren't having any of it and unite to vote against a government that, they later tell CBC News, has "no credibility." When the votes are tallied, a flurry of flying paper greets the news that the government is defeated. The nation is facing tough economic times – high inflation, rising unemployment and a spiralling deficit. Crosbie's belt-tightening budget imposes more taxes on energy and will boost the price of Canadian oil closer to levels in the rest of the world. By removing a proposed gas tax of 18 cents per gallon, Crosbie's budget could get support from the House's five Social Credit members. But he refuses, and the five members abstain from voting. The numbers just don't add up in Joe Clark's favour. With three Tories of 136 out of the House (in hospital and overseas) and five Social Credit abstentions, Clark is up against 112 Liberals and all 27 NDP members. His government is brought down, 139-133. Not seven months after he became prime minister, Clark will be hitting the hustings once more after he sees the Governor General to dissolve Parliament. " TORONTO, OTTAWA — The game plan was good: Force an early election on the economy that the Conservatives would easily win, or take public subsidy money away from the opposition parties, especially the bankrupt Liberals, who are $3-million in debt. It was a perfect fit with Stephen Harper's war of attrition. The Prime Minister is known as a man who gets up in the morning with a determination to destroy his political opponents. The inclusion in the government's economic statement Thursday of a measure to end subsidies to political parties for every vote they earn was as popular inside the Conservatives' parliamentary caucus as it was a red flag to an infuriated opposition. The miscalculation was that Mr. Harper and his inner circle did not believe that all three opposition parties – the Liberals, NDP and Bloc Québécois – would agree to defeat the Conservative minority government in the House of Commons and offer a coalition as an alternative." OTTAWA–The Liberals could soon find themselves back in power – but not necessarily with Stéphane Dion as prime minister. With the three opposition parties expected to continue negotiations over the weekend, the big question remains: Who will lead a coalition or some other form of alternative government? Negotiations had settled on Dion at the helm but that could change quickly if the Liberal leader proves a liability for a new government – and fodder for the Conservatives, one Liberal strategist said. A senior Liberal said the coalition leader would not be any of the three Liberal leadership contenders – MPs Michael Ignatieff, Bob Rae and Dominic LeBlanc. An organizer for Rae said the three candidates had already talked and agreed to keep a united front with a focus on calling for an economic stimulus package as their party navigates through the next week. Prime Minister Stephen Harper was already framing the possibility of Dion taking power as a negative and undemocratic option. "They want to take power, not earn it," Harper said at a news conference outside the Commons yesterday evening. OTTAWA — Jean Chrétien's phone rang in his downtown Ottawa law office Thursday morning. Ed Broadbent, his old friend and political foe, was on the other line. NDP Leader Jack Layton has asked the party's elder statesman to call the Liberal Party's éminence gris about a Conservative initiative that had angered him and other opposition MPs. “This is a major attack on our parties and we have to do something about it,” an insider said Friday, characterizing the telephone call between the two political veterans. Word had begun to leak that the Harper Conservatives were ending the $27-million annual taxpayer subsidy to political parties. The $1.95-per-vote subsidy was introduced by the Chrétien government in 2003 as an attempt to clean up political financing by weaning the parties off big corporate and union donations. Mr. Chrétien, who had also been receiving calls all day from MPs and other Liberals – which always happens to him when there is a crisis – was clearly engaged, said a long-time friend. His advice to MPs has always been to stay disciplined. He has always said that being in opposition means to “oppose” not “appease,” the friend said. Mr. Chrétien was upset that legislation he introduced was being undone. And so the two men, who sat across the aisle of the House of Commons from one another for more than 30 years and battled each other in the chamber, talked it out." After losing a federal election in 1979, Pierre Trudeau announced that he would resign as Liberal leader as soon as his successor was chosen. But before that happened, the Conservative minority government was defeated on a budget vote, and Trudeau led the Liberal party to one more election victory. Does Stéphane Dion think that by hanging on until a new Liberal leader can be chosen, most likely next May, he might get a chance to repeat Trudeau's exploit? Yesterday's Globe and Mail reported that on the weekend, Dion told one defeated Liberal candidate to "stay strong and trim and be ready," and that the budget the Conservative government is to present in February "is going to be a mess." But if Dion does have secret fantasies of pulling a Trudeau, his party, in particular the caucus of Liberal members of Parliament, might have other ideas. That Dion's intentions were not leaked before he announced them yesterday suggests that he had not shared them with many Liberals, let alone obtained widespread approval for them." posted by JoeBlog at 1:30 p.m. Negotiating Windsor-style. How the heck does anyone negotiate with people in Windsor? I would not know how to do it at all. It must be frustrating for Governments and the auto companies as an example. Frankly, if I was involved, and I have negotiated many agreements over my many years of practising law, I probably would be pulling my hair out dealing with some of our municipal and union leaders. It seems they cannot be pinned down so how can one tell if one can reach an agreement or not. Absolute positions change so quickly that it is mind-blowing. City council is willing to discuss additional border infrastructure solutions -- including those involving E.C. Row Expressway and Lauzon Parkway -- once the provincial and federal governments sign off on four portions of the Windsor Gateway border action plan recommended by council a month ago. Last month, council agreed to propose upgrades to the Windsor- Detroit tunnel plaza, a pedestrian overpass at Assumption high school, roadway redesign to accommodate truck traffic flow for the Ambassador Bridge's new preprocessing centre on Industrial Drive and a grade separation at Walker and Grand Marais roads." As you know, there was a Phase 1 agreement signed with the Senior Levels but there never was a Phase 2 agreement ever signed. As far as Lauzon/E C Row Role goes, I personally find the City’s position so confusing that I do not know what it is. As I have tried to show before, the City’s position seems to be completely contrary to what Sam Schwartz wanted and which the City endorsed. Francis insisted the new Schwartz plan, which cost the city $500,000, is not negotiable. "This is it. This is the city of Windsor's position." Halberstadt said on his blog: "New York transportation guru Sam Schwartz, with a full team of technicians, is back in town and ready to engage in intense modeling with the province's engineers to hopefully find a compromise on the road's many nuances." Lewenza said Tuesday the use of the word "compromise" suggests the city is poised to settle with DRIC for something less than its official stance -- that the route must be tunnelled. "This is a billion-dollar file and he is out there saying we want a compromise," Lewenza said. "I challenged him on that. Mayor Eddie Francis says he was left frustrated by his meeting with Detroit River International Crossing representatives on Tuesday, and no progress was made in the "stalemate" between the binational study group and city hall. But Francis said an additional purpose of Tuesday's meeting was for the city to determine if a solution could be reached in its deadlock with DRIC. Francis said the city remains committed to its GreenLink proposal, but "we understand the significance of this project. What we were hoping to have was meaningful discussions under the environmental assessment process, whereby a compromise could be found. "We have always indicated, we have always demonstrated, that we are willing to talk, we are willing to discuss, we are willing to work towards solutions that are good for the community. We were hoping, and we continue to hope, that DRIC feels the same way." We don't see this as us being the problem," Mr. Lewenza said, adding he would "absolutely not" accept any further cuts after losing tens of thousands of jobs in recent years. "We've suffered our share of pain." WINDSOR, Ont. — Canadian Auto Workers president Ken Lewenza opened the door Tuesday to being part of a plan to rescue one or more of Detroit’s financially troubled automakers. “ I don’t want to say ‘ never, never, never’ when it comes to these kind of discussions because whenever there have been problems in the industry, we have responded. CAW president Ken Lewenza challenged the federal government Thursday to introduce "fair trade, not free trade" legislation to help deal with the current crisis in the domestic auto industry which could lead to one or more of the Big Three companies collapsing. "If that legislation is enacted, you will see the full creativity of the CAW brought to bear on this crisis," said Lewenza during a three-hour seminar to union officials. "We can't under any circumstances let these companies go bankrupt and the CAW will continue to play a lead role in making sure that doesn't happen," said Lewenza. "But labour concessions alone can't solve this problem. We need a fundamental change is the way auto companies and the government conduct business in this country. " It may be that one has to ignore everything that Windsor negotiators say. The best idea may be to impose a take-it-or-leave-it solution early on and stick to it. Then watch them squirm to get something in the face of defeat so they can pretend to be the winner with their respective publics! posted by JoeBlog at 11:00 a.m.
Do you think it was done deliberately? It was US Thanksgiving yesterday and Canada's Economic Statement was issued at around 4 p.m., just before many Americans would be sitting down to their Thanksgiving meal. Do you really think that the Canadian Government wanted to ruin the Bridge Company Owner’s Thanksgiving Day dinner and give him indigestion by telling him that they were going to build the DRIC bridge. Hardly. The Finance Minister really just gave him an early Christmas present. There is no doubt about it at all anymore. Minister of Finance Jim Flaherty put the knife into the heart of the DRIC project today in his Economic Statement. “Canadians need to continue building a modern and reliable infrastructure. Investing in a 21st century infrastructure will create a competitive advantage that pulls business and jobs into a vibrant national economy and brings our skills and goods onto the world stage efficiently. It will also stimulate the economy and put people to work. The Government is significantly boosting its support for provincial, territorial and municipal infrastructure. Next year’s increase will be the largest and will push the total amount available in that year to about $6 billion. Given current economic circumstances, the Government is actively looking at ways to accelerate the roll-out of anticipated infrastructure projects. At their November 10th meeting, First Ministers agreed to work together to speed up infrastructure projects. The Government will work with provinces and territories to identify, by January 2009, specific projects in each jurisdiction that would contribute to stimulating the economy in the next two years. Further, it will work with the provinces and territories to tackle regulatory and administrative barriers to moving these specific projets forward. The Government is also pursuing public-private partnership opportunities in order to lever private capital and expertise to help meet our infrastructure needs. This will be accomplished through PPP Canada Inc., a new Crown corporation which will be fully operational in the new year. What’s that you say? How can I possibly say that the DRIC is dead when the language of the Finance Minister plainly said that the new Windsor/Detroit border crossing would be built as soon as possible? I believe that the Minister has been sufficiently chastised and did not want to testify in court that he was the one responsible for creating the reasonable apprehension of bias such that the DRIC project would have to be set aside. He’s leaving that to Ministers Pupatello and Duncan to be responsible and take the blame. He did not say anything about a DRIC bridge. He talked about working with partners but he did not identify who they were. And he said that a new crossing would be built. He did not use the magic DRIC words that the bridge would be completed by 2013 either. It could mean the Enhancement Project bridge couldn't it! He is hedging his bets. If the Finance Minister meant the DRIC Bridge, why didn't he just come out and say it. He already has a partnership with the Ambassador Bridge that has lasted for almost 80 years. He knows, as the President of the Bridge Company stated, that the Company does have a legal right to build its bridge. He is not going to go out on a limb especially when he wants to be the Premier of Ontario and that the bridge is necessary if Ontario is to prosper. Sure, sure, sure you say skeptically. More wishful thinking on my part. That is what the Government means by “priority.” It is the same type of "plain language" that every Government official has used with respect to the importance of the border crossing for years here. And nothing significant has been done. 1) There is no Government money for the project. While the Finance Minister likes to throw around big numbers such as his $33 billion Building Canada Fund, “Canada’s municipal infrastructure deficit is now $123 billion.” Urban transit requires $23 billion alone. 10 years ago the National Highway System required $17 billion. “Provinces and territories have identified the need for approximately $97 billion in capital investment in transportation priorities.” And that does not include other spending for other modes of transportation. Do you really believe that anyone will allow this area to receive $5 billion for a new road and bridge? $6 billion total for next year across the country---a drop in the bucket considering all of the projects across Canada. Expect the Province to support in 2009 an at-grade or below grade "cheap solution" and an upgrade of the E C Row Expressway to provide access to the Ambassador Bridge in the end. Thousands of jobs will still be created, enough to win votes. 2) The Minister attended at the P3 conference recently and is well aware of the difficulty that P3 companies are going to have in raising money for projects. In fact they are actually looking at Governments to help finance the project which begs the question why the private investors are needed at all. If you read the financial pages, then you know that the $50 billion plus Bell Canada leveraged buyout is in trouble because “a preliminary report by the auditor KPMG found that “given current market conditions,” it would not remain solvent once it took on the $33 billion in debt needed to take it private. If the Ambassador Bridge is not put out of business by the Governments, then no one can issue a solvency report for the new bridge which means it’ll never get built using the money of private investors "given current market conditions." How can it be solvent if it is so expensive that a $200 toll might be required for car to cross the bridge unless there is a huge Government subsidy every year. Oooops, Governments have no money for subsidies and guarantees. Do not forget, the only money that the Federal Government has put forward is $400 million which is to be used to pay 50% of the eligible capital costs for the DRIC road. They were never going to put in any money for the new bridge and plaza. That was to be financed by the P3 investor. 3) Unless something changes drastically, it is highly unlikely that the Michigan Legislature will pass legislation to permit P3’s to be utilized. They are not legal there yet. That means that Canada will only be able to build half a bridge. I do not need to remind you about the financial position of Michigan and the have-not Province of Ontario either. 4) An investment grade traffic study was supposed to have been prepared presumably to bolster the Governments’ case that there is sufficient traffic so that an investor would make a return on its investment. As everybody, except the DRIC seems to realize, traffic at the border has dropped significantly and with the economic difficulties in the automobile industry especially, the likelihood of traffic recovering quickly is very low. Accordingly, since I do not believe that this study has been released one has to ask the obvious question, why not? 5) There will be lawsuits if there is no agreement that will last at least a decade or longer. That may well be the Governments’ objective since clearly they cannot build the DRIC project today. They may well hope that there is a lawsuit to stall off everything until they can try again to justify the unjustifiable. The DRIC team has been accused of some terrible actions that has prejudiced the process. Eddie is doing his part by trying to egg on the Bridge Company with his foolishness. However, he has also put himself out on a limb with his DRIC road opposition such that he may have to sue to prove that he is not all talk and no action. The Federal Government believes that the International Bridges and Tunnels Act will give rise to a lawsuit one-day. The Province and its Ministers are doing their best to create the element of bias in the process. The Bridge Company is sitting there trying to figure out which of the parties they should sue first even while they are moving forward on their Ambassador Gateway. 6) So far, no one has been able to figure out how to get rid of the Ambassador Bridge Company. The Globe and Mail 2 1/2 page spread destroyed the assumptions that were made that the Bridge Company was going to sell out by caving in to the pressure of the Governments. With them around, not only will the DRIC bridge not be built but the plan to P3 the Blue Water Bridge is probably dead as well. In fact, it may well be that Governments need the Bridge Company to save their bacon in Buffalo/Fort Erie since the Peace Bridge is having all kinds of problems with their project these days. Wouldn't it be hilarious if the Governments finally figured out that the Bridge Company ought to be running all the crossings in this part of Ontario with Michigan and New York State, including the Tunnel. 7) When the Americans finally wake up and figure out what Canada has been trying to do to them with their Corridors and Gateways policy, do you think that they will be pleased? Will the new President carry a grudge against a Canadian Government that tried to make sure with NAFTA-gate that he would not be the President and threatened the Americans with respect to oil and Hydro energy? Do you really believe that an American Administration will help Canada put an American private enterprise operator out of business? Do you really believe that the US will allow Canada to control its border crossings, especially if the shared border management concept is brought back? 8) When the real story of this border file is finally revealed, when its real purpose is finally disclosed and after heads have rolled, you will be shocked at what you learn. You will truly not believe that this is the way that two democracies are run in the interests of its citizens. It will all seem like a nightmare with a waste of taxpayer money that is beyond belief. I could go on with more reasons but I think that is enough for my purposes. Call it what you will, call it wishful thinking for all I care, but as far as I am concerned there is no longer any stomach on the part of the Governments to move this file any further. They can hope and they can they bury their heads in the sand thinking that everything will turn out the way that they had planned. That is why they are bureaucrats and not entrepreneurs. While they can talk about it and they can make threatening statements, they also have to know that they have an opponent who is not intimidated by them and who in fact has sued them in the past and won. One needs to read very carefully what is said by Governments. The words used have many different meanings. What you think a statement says may not be what it really means on its face. You will find with government, as I learned very early on in the border file, that what they say may well be accurate but it is very narrow as well. Remember that the MDOT Director has said that a new bridge may not be needed until 2035. If that is the case, then why would a bridge be built 20 years ahead of time? ASAP in Government time and in dealing with this file means no DRIC bridge for a very long time. That is what the Finance Minister said yesterday. Let us be real, there is another Provincial and Federal election in a couple of years. Politicians can still be elected promising us all kinds of border goodies while, ironically, the Bridge Company makes it easy for them to attack them by running the best border crossing in North America. Let me be direct and to the point. Where is the official Opposition in the Province of Ontario? Are they asleep? Let me be even more direct and to the point. Where is the Premier? Is he asleep too? Finally, let me be even more direct and even more to the point. Where is the Fourth Estate in Windsor? Are they all asleep as well or has the amnesia disease hit them? The group requested a meeting two weeks ago with Finance Minister Dwight Duncan, the MPP for Windsor-Tecumseh, and Windsor West MPP Sandra Pupatello, the minister of international trade and investment. Peakovic received a response -- a negative one -- Tuesday from Duncan's assistant, who sent him a copy of a Nov. 20 letter she received from Ontario's acting integrity commissioner. You will have to explain to me the difference between the jail issue and the border file. Here again is a copy of a letter signed by Dwight and Sandra that was sent to the City with respect to the DRIC matter. “'We're so close you can smell it and taste it," confided a provincial government insider who believes Queen's Park and Windsor are just "tweaks" away from a win-win border infrastructure agreement. "because it "may be interpreted as an attempt to interfere with and/or influence" the process." In the circumstances, in my opinion, Sandra, Dwight, the Premier or a Member of the Opposition have no alternative now but to submit to the Integrity Commissioner a question whether Sandra and Dwight have breached the provisions of the Act respecting the border. The Commissioner has no choice but to commence an inquiry under the Statute forthwith. If there is a breach, then in my opinion, the Ministers must resign or be fired by the Premier! "We did things that newspapers can do to bring about change, positive change." What is even more reprehensible is that this jail issue and the comments made by the two Ministers make it easy now for anyone to bring an application to set aside the entire DRIC process because of a reasonable apprehension of bias. All this time and all this money down the drain. Why is everyone so quiet on such an easy matter? It does make one wonder doesn't it. I see that he is modest because in that report which does deal with our Windsor/Detroit border crossing amongst other matters I do not think he mentioned his role with the Government of Ontario. I guess he was just too modest and did not want to bring attention to himself and his former job. I say that he is smart because he was the Chair of the Canadian International Council Border Issues Working Group that prepared a report entitled “A New Bridge for Old Allies.” What a clever play on words too. These advisers for Mr. Kergin’s Board would have so many things to do and so many committees to set up that it might take years for them to undertake their tasks. At a very nice salary I am sure and with perks to match, although Finance Minister Flaherty may be a Scrooge and take away some of them because of the economic position of the Government. Seriously, who could be better on the Canadian side than a former Ambassador who is so familiar with border issues because of his job with Ontario. Today the President met with the Prime Minister of Canada in their first meeting as leaders, exchanging views on critical foreign policy issues, including Afghanistan and global climate change. The leaders agreed to appoint two high level Personal Representatives, Mr/Ms……, from Canada and the Honourable……, from the United States, to prepare recommendations to modernize our shared border and to secure our economic competitiveness, including devising a bi-national body to coordinate the implementation of new border measures. I won’t be so bold as to repeat what I think it is but you, dear reader, know that already. Let’s just say that I think an awful lot of money has been wasted for a reason. Of course, since he was a former Ambassador, he can call it a 3P while everyone else calls it a P3. That reversal of the letter and number would probably be one of his first contributions to the new PJBC. What I liked about his statement though was that there were no ifs, ands or buts in what he said. I am sure that he will be able to testify about this when called as a witness in the lawsuit to set aside the DRIC for bias. He can explain how he knew all of this even before the final DRIC report. Mind you, so many Ontario and Federal politicians have already made statements giving rise to an apprehension of bias that it will be interesting to find out who specifically told him what the result would be. This report must have been written before the economic meltdown or else the former Ambassador might not have been so effusive in his praise about P3s, ooops, 3Ps. There was one interesting oddity in his report. There was absolutely no mention of the Ambassador Bridge. It is as if that Bridge never existed. We didn’t get even the usual stuff about how much traffic went over that one bridge. There, you saw the word “expanded” or was he talking about the P3, ooops, 3P of the Blue Water Bridge that the Finance Minister might want to dispose of. I should not be so cynical about the former Ambassador. After all, in one sentence he cleared up for me the complete absurdity of the entire DRIC process and the way that the Governments are handling this. It echoed a comment made in the Canadian Senate when one of the Senators asked why people would want to invest in Canada when Canada has treated one of its partners so poorly. The Governments have had a private enterprise partner for almost 80 years at the Ambassador Bridge. According to the President of the Bridge Company, there are legal agreements that allow the Bridge Company to build its Enhancement Project. It is not as if Governments did not know what the Bridge Company was doing. Just ask MDOT what they called their relationship with the Bridge Company. The US Governments and the Bridge Company have spent hundreds of millions of dollars on the Ambassador Gateway project which was designed to accommodate a second span. The Governments on both sides of the river are well aware that this project has been going on for over a decade and that the Bridge Company has spent about $500 million to date on this project. Instead of trying to do a deal with them, the Bridge Company has been ignored. The Governments have decided to bring in another private enterprise partner to take away up to about 80% of the Bridge Company’s business if the US Draft Environmental Impact Statement is correct. The International Bridges and Tunnels Act is nothing more than an attempt to control the business of a private sector partner of the Canadian Government. It was a statute directed towards one Company in the guise of applying to all of the bridges and tunnels in Canada. It was one of the tools used by Governments to try to force the Bridge Company to sell out to them at a low price. It is hardly a model that I would put forward to the world as the former Ambassador is doing. One final note. 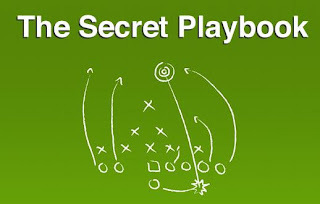 Do you remember the BLOG that I wrote: March 07, 2008 “Obama Issue: Canada's Ultra Secret American Playbook." This time it is being used against the new President! I am sure that no one thinks the Americans are smart enough to figure out what is going on because if they did....all hell would break loose! "While the bilateral relationship is too complex for a single government to “manage,” the role of providing some guidance to the increasing number of government and non-government players nonetheless remains. This role requires that practitioners of the relationship share information about the US and seek guidance from the main co-ordinators of Canada-US relations, such as the Privy Council Office, Foreign Affairs Canada, International Trade Canada and Canadian missions in the US, among others. An important motivation for co-ordination is to ensure as much as possible that Canadian actors speak with a single voice in their interactions with US officials." "As mentioned earlier, practitioners believe it is useful to keep non-contentious issues at the working level, avoiding conflict and resolving issues at the operational or regulatory level before they become matters of policy or high politics. It is also an effective means of avoiding the linkage of disparate issues in bilateral negotiations." Let the Trusted Personal Representatives resolve everything and then the two leaders can just rubberstamp it at their next meeting. No fuss, no muss, no bother. posted by JoeBlog at 12:05 a.m. Here is what you may have missed in the news. At the Mayor's big event on Saturday, I admit that I did not go. I was not "summoned" by His Worship as residents along the corridor were so I thought I could not attend. However, an inside source who attended the 2 hour harangue told me that when a resident asked if the presentation and materials presented were going to be on the City website, Mayor Francis said yes and that he thought it was on the web but that it would be up shortly. Naturally I went to the City's site to read it but it was not there. In fact, I am writing this at 7 PM on Tuesday night and it is still not there. How can that be? Do you think that it might not be posted until it is too late for DRIC to comment on it while they were in town? Could the Mayor be afraid that they might point out any inaccuracies or out and out errors? No that cannot be it. There must be some technical reason why it was not posted in a timely fashion. You may have been surprised when I said that the Mayor treated Councillors like school kids when he scolds them at Council. Now I have absolute proof that Council on Mondays is a kindergarten! 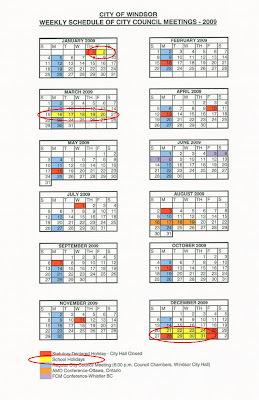 Take a look at Council's calendar for 2009 telling them all the days on which there are school holidays so they can get their time off with their parents! Windsor firefighters investigate a fire at the Nemak of Canada Corp. plant near Ojibway parkway in west Windsor Sunday night. Fire crews were called to the aluminum plant at 5:30 p.m. after employees reported smoke in the building. No one was injured." Isn't that plant near where the DRIC bridge and plaza is proposed to be located? Right near all of those power plants! Close by the salt mines and brine wells. I am sure that you read Senator Kenny's article in the Star: "Defence spending key to cross-border trade." "Everyone also knows that Americans are by far our most important customers, but we're having trouble selling to them lately. It's not just because the U.S. economy is sagging or that the Canadian dollar has been overvalued. U.S.-Canadian border crossings are clogged. One suspects American politicians are thrilled that the thickening of the border reduces Canada's attractiveness as an investment for firms that want to serve American as well as Canadian markets. After all, if the borders are a problem, why not locate in the U.S. instead? Those clogged borders are non-tariff barriers to trade. What to do? It's going to be a chore to convince a Democratic administration with a protectionist mantra that it is in both countries' interests to make those border crossings workable again." I guess that the good Senator forgot that he was supposed to slam the Ambassador Bridge. "When he was Treasury secretary during the Clinton administration, Mr. Rubin helped loosen Depression-era banking regulations that made the creation of Citigroup possible by allowing banks to expand far beyond their traditional role as lenders and permitting them to profit from a variety of financial activities. During the same period he helped beat back tighter oversight of exotic financial products, a development he had previously said he was helpless to prevent." "To make matters worse, Citigroup’s risk models never accounted for the possibility of a national housing downturn, this person said, and the prospect that millions of homeowners could default on their mortgages. Such a downturn did come, of course, with disastrous consequences for Citigroup and its rivals on Wall Street." Just you wait and see...With this push to infrastructure being our salvation in the economy and P3s financed from groups such as pension plans investing in illiquid projects at overpriced amounts that make no sense like the DRIC project, expect Government bailouts of bankrupt plans to protect the pensions of seniors! "The search for office space was focused on two primary sites - an office building just a few blocks south of the downtown and another location about 10 blocks to the west." BERLIN - Wanted: Cheerful, chubby men, preferably with fluffy white beards and no criminal record, ready to work hard for one month. Germany is running out of qualified Santa Clauses and needs to recruit and train them fast, a leading job agency says. Germans are trying to shut out the financial crisis by taking comfort in traditional festivities, and there is an acute shortage of Santas to entertain children at shopping centres, Christmas markets and private parties." I just briefly mentioned this the other day. Look at what STOPDRTP was able to achieve with very little money but with a dedicated group of individuals who were actually fighting to protect their neighbourhood from a disastrous truck Expressway that would have cut through the heart of their Community and the City. We were a very smart bunch, if I may be so modest, who quickly learned how to use the media to our advantage even though a number of significant media types were opposed to us. We learned how to capitalize on opportunities that were presented to us. We learned how to scare politicians successfully at every level. In reality, our power was not what we planned or did but that we had the strong backing of the people who supported us for our actions. We knew that any time that we needed people to attend a meeting or to write a letter to the Government or to phone in to a talk show or send a Letter to the Editor that we could mobilize the Community as we did on many occasions. Everyone knew that too! We were smeared by our opponents. Oh we were called NIMBYs but that was an easy way to attack us. Was it that hard for people to understand that our residents were trying to protect their homes? The nasty names did not stick for very long because early on we came up with a plan that we believed would solve the border problem that was good for the entire City, not just our area. I can remember when the Star changed its editorial position on DRTP. They did not have the courtesy to mention our group but they did say that no politician could be elected in Windsor who dared support what we opposed. And it was true. Can you imagine what we could have accomplished if we had $1 million for advertising blitzes the way our Mayor did? Can you imagine what we could have accomplished had we had Mayor Hurst on our side? We had to fight to get Council to agree to support us but we did. Can you imagine what we could have accomplished if we supposedly had 17,000 or more families supporting us? In hindsight, we were probably one of the most successful citizen groups ever. Even now, I cannot believe the power that we were able to gain so quickly. I remember Letters to the Editor accusing us of controlling Council and hearing that Councillors were our puppets with us pulling the strings. What we accomplished we did in a few months time. We were responsible for stopping DRTP. Compare that with our Mayor and Council to see how little they have achieved after so much time and after spending so much of the taxpayers' money. To be direct, that is why the Mayor and certain members of Council are a huge disappointment to me. They squandered the opportunities that STOPDRTP and the Citizens of Windsor gave them on a silver platter over all of these years. It is push come to shove time and I am afraid that Eddie as far as I’m concerned has fallen short. I wonder if he goes to bed every night praying that the Owner of the Bridge Company will start a lawsuit to stop DRIC cold to get him off the hook personally. It is clear that our Mayor does not have the nerve to do so or else he would have taken action by now to support his words. Instead, he keeps telling us that the process has another year to go and that we can make submissions to the Minister of the Environment to show our outrage. Eddie knows that he cannot act. The consequences would be too severe for him and his future. Why else would that blatant addition have been made to the Sandwich Community Improvement Plan to target only the Bridge Company homes on Indian Road. Why else would Greg Heil resign because the Heritage Plan presented to his Committee was political in nature against the Bridge Company as far as he was concerned. Why else does Eddie keep baiting with comments such as someone cementing up the Tunnel. Eddie has good reason to be concerned about what he does based on the comment made from a representative of Sandra Pupatello to one of the Bloggers in town. I wonder what Dwight really told Eddie on the way to the airport. Take a look at the jail story in the Star. It is not that big a deal in the scheme of things such that if the Province wanted to teach Eddie a lesson they could pull it out of the City quickly. I am sure that Eddie knows that and that is why he is so quiet now about the jail going to Brighton Beach. He knows that the Province is not kidding anymore and that they are tired of his whining and his constant opposition. Instead of being grateful, he does nothing but cause misery to our two Cabinet Ministers. At some point in time, the Premier will say enough is enough. There are other areas of the Province that would be happy to receive the Province’s largesse at a time when the Province is in financial hardship itself. Valuable construction jobs will go somewhere else if the community succeeds in blocking approval of a new $50-million jail on the city's outskirts, the president of the Essex and Kent Building Trades warned Monday. Furer's warning was echoed by a spokesman for the Ministry of Community Safety and Correctional Services. "There's a lot of steps that this has to go through," Stuart McGetrick said. "We want to listen to what the community has to say. If at the end of the day we fail at one or more of the hurdles, then (we'd) obviously be in a position at that point to maybe reconsider the site." Is it “fear mongering” as one resident complained. You better believe that it is. And our Mayor is well aware of the message that has been delivered. Just look at how weak-kneed Eddie is with the DRIC road matter. Where is the Estrin legal strategy that is months overdue? Or has it been delivered and has it been shelved because the Councillors have prevented the Mayor from even talking about a lawsuit now? Has there been polling done and if so what are the results? Based on the response of the Mayor, it has to be that people are more concerned about jobs than Schwunnels! How apt a description. Just like with Councillors, there is Professor Eddie teaching the lessons to the school children. The crowd is to respond not Eddie. He cannot be blamed if the Province pulls the plug on the DRIC road. It would be YOUR FAULT, dear reader, because YOU corrected their inaccuracies not HIM. Eddie prefers from my experience that others be front and centre when the going gets tough. That is NOT how the leadership of STOPDRTP acted. We were there with our supporters on the picket lines, hammering in signs in the middle of winter, going around getting letters signed by residents so that we could inundate the Government. Eddie had his chance to be successful and he did not act. STOPDRTP was able to mobilize the community at election time to ensure that politicians supported our position. We made sure that the Senior Level politicians understood what would happen to them if they did not support the residents of this City. They understood loud and clear. Our Mayor could have pressured Sandra Pupatello. Instead, he endorsed her. The East End of the City was his base for electoral support. That is where Dwight ran as well. Did you ever see a story about him going out and forcing Dwight Duncan to capitulate during the last Provincial election? Why not? Why didn’t he force these Provincial politicians in the last election to do what he wanted as Mayor of Windsor. Don’t you think that they would have been concerned about their positions if he was going to lead the charge against them? Where the Mayor was invisible during the Provincial election, the leadership of STOPDRTP was not when we had the opportunity. I remember when I first met our Mayor when he was still a Councillor and supposedly had not yet made a decision whether he was going to run for Mayor or not. I think he knew then but he never shared the information with the small group of people that he spoke with that afternoon. He had been invited over just to explain the background of the border file. It was a way that we could be brought up to speed very quickly. He astounded me by telling me that he thought that the border matter would be over within a few months. He told me that if he ran for Mayor that he did not want it to be the focus of his Mayoralty. There were other issues that he was more concerned about dealing with. I knew then, and told him so, that he was wrong and that the border file would never be that simple. I knew it would consume him and it has. I thought about that episode as I am writing this BLOG. I still do not believe that his heart is in the fight the way it was for those of us in STOPDRTP. Oh sure, when he became Mayor he understood the significance of the file and the importance that it had for Windsor. Certainly, he has worked hard to try to achieve what he thinks is the answer, whatever that might be. Contrary to what you may believe, my comment was not meant to be cynical. His problem in my opinion is that he has never trusted the Community and accordingly has never really shared with us what he hoped to achieve. He has never really been able to get us on his side emotionally. It has all been smoke and mirrors and presentations and scare tactics. We have never been his ally in my opinion but rather just a pawn in his game to be used as required. The Saturday meeting is a classic example of that. We really are no further ahead now than we were years ago. His fight with the Ambassador Bridge Company makes no sense when that Company has to be dealt with before we will get a final border solution. His stalling is obvious but for what purpose. Do we really know? His phony dispute with the Senior Levels over Greenlink and the DRIC road has gone on way too long such that the project might die in the end because of the economic meltdown. Even P3 companies may not be able or willing to participate. I remember being asked on many occasions how many members STOPDRTP had. My answer was that I never knew. We were not an organization that had members with a membership list and membership dues so that we could keep count. We never intended to be around for very long time. We were people who were interested in protecting our City and did so. People knew exactly what we stood for and what we were trying to achieve. They participated with us as equals IE people trying to save their homes. When we called upon them, they responded. We never asked of them what we ourselves were not prepared to deliver. That was the secret behind STOPDRTP and the reason for its huge success. It is a shame that our Mayor was never able to capitalize on what our group was able to achieve for him and his Councils. Now you know the answer to the question. posted by JoeBlog at 11:15 a.m.
Oh my. Quick our Finance Minister Jim Flaherty may be a P3 addict! Has he not learned anything from the economic melt-down? Is there a P3 Anonymous so that he can join? Can he be sent to a P3 rehab clinic? Could this become a new area of expertise for Brentwood? "Ottawa wants to build billions of dollars of bridges, hospitals and other infrastructure as a way to lessen the blow from the financial crisis, Finance Minister Jim Flaherty said Monday. Flaherty said all levels of government need to work together to roll out P3s as quickly as possible in order to keep Canadians employed and the economy going. He said co-operation between the different levels would be key to the effort." I Blogged before that taxpayers would be fleeced by P3 deals with Windsor as the template. Look at the DRIC project as a classic Megaproject that has run amuk. I hope someone sends the Minister my BLOG soon or we taxpayers are in BIG trouble. Have we been "Delrayed" in Windsor yet by the idea of the DRIC/Greenlink multi-billion dollar road with parklands for the masses and a new bridge? When you figure out what it will really cost us over 40 years if they really go ahead, don't we really have better uses for the billions that will go into the P3 operators' pockets? This BLOG will demonstrate the absurdity of the DRIC project financially. It will require a massive Government subsidy or it will go bankrupt taking the other area border crossings down with it. P3s like this will result in the biggest transfer of money from the public purse to the private sector for years considering that some of the leases go on for 99 years. It will make financial meltdowns the norm as Governments are called on their guarantees to support these foolish deals! "The 50km, $27.5 billion Eurotunnel, nicknamed the Chunnel, has become a classic example of a technological marvel that has been unable to justify the costs of its creation. "Without a doubt, the Channel Tunnel would not have been built if we'd known about these problems," Richard Shirrefs, Eurotunnel's former chief executive officer, said." Take out a calculator as you read along and you can do the math as well as I. As an easy step, just figure out what 5% of $5B a year is for borrowing costs alone and figure out how that will be paid for considering that estimates of the Ambassador Bridge income is a fraction of that amount. Don't forget to add on top of that operating costs and a significant return on investment ie profit! Estimates for the road are around $1.6 billion but they are just based on MTO guidelines not on actual numbers. We just saw the cost of work at Manning Road going from $125M to $200M in one year. If we assume that there will be some kind of a financing deal for the road, Plaza, and bridge, then we are looking at a project in the neighborhood of $3-$5B or more, about twice the number that we’ve been quoted to date. The consortium that acquired this project spent about $3 billion as the acquisition price for a 99 year deal. The length of the road is 108 km with 400,000 users per day. These days the maximum toll for Highway 407 for a car at peak time is: $20.50. For trucks, it is $61.51. It is a project for a six lane bridge, 100+ acre plaza and 9 kilometre road. Usage if there was such a road today would probably be not more than 50,000 vehicles per day. Your guess is as good as mine as to what the final cost would be but for the sake of argument let’s say it is between $3-$5B. My point for giving all this information is to ask whether anyone would use the DRIC road and bridge assuming that tolls were comparable to Highway 407 or the Confederation Bridge. Of course not is the obvious answer because they could use the Ambassador Bridge at a much lower cost and would use Huron Church and other Windsor streets at no cost. Now you understand why the Bridge Company has to be put out of business and how the road system will be used as the ultimate Government weapon to do so. Look at the numbers. Highway 407 is about the cost of the DRIC project while the Confederation Bridge is a third of it. Highway 407 would have about eight times the volume while the Confederation Bridge would have about 1/25th of the volume. Highway 407 fought a lawsuit with the Province with respect to their right to charge whatever toll they wanted while in PEI, the Government provides a huge subsidy annually for the Confederation Bridge. The length of the DRIC proposed P3 deal would be about the same as that of the Confederation Bridge, 40 years, while the Highway 407 Consortium has 99 years to make back its money. The Bridge Company I believe said that their analysis showed that tolls at a DRIC bridge would be about three to four times higher than theirs. Using Highway 407 as an example, since the cost is about the same, a toll on the DRIC road if one was charged should be about $20 even though the length of Highway 407 is so much longer. However, only 1/8 the number of users would use the DRIC road and the P3 operator would have about half the time to collect its money compared with the operators of Highway 407. On that basis, the cost of the toll could approach $200 per car and not be considered unreasonable. What should be obvious by now by looking at all of these numbers is that the DRIC project is not financially viable whatsoever. And I have not yet talked about competition from the Bridge Company or the Detroit/Windsor Tunnel. The expectation from US DRIC is that the new project will take away about 80% of the Bridge Company’s business and a good chunk of that from the Tunnel and the Blue Water Bridge. They have to say that don’t they or else no one would be interested in the project whatsoever. Wasn’t it a 50-50 split before between the DRIC Bridge and the Ambassador Bridge? If those assumptions are not correct, then what happens to the new bridge? Obviously, it goes broke. Any way you want to look at it however this project is not financially viable and taxpayers will be stuck paying the bill. Has anyone explained that to you yet in the mountains of paper that had been produced by the DRIC consultants? Is there a section on Governance and Finance in the new DRIC Draft EA material. If so, I don’t remember seeing it. If not, now you know the answer why! It could never be justified. Are the investors concerned? Not in the least. They are happy about it. They are encouraging it. They are trying to induce the Governments across North America and elsewhere to do even more of these types of projects. Could DRIC be one of OMERS' Michael Nobrega's "Alpha" infrastructure projects ie a major infrastructure asset. If you want an "alpha" deal to open up your London office and to invite all those oil-rich Sovereign Funds to participate in, it has to be a multi-billion project and not one for a paltry few hundred million. Come on, you need big amounts and MegaProjects to play in the P3 big leagues. Is Nobrega facing competition from "Australians" who have been talking with MDOT, perhaps for the same project? I wonder who those Australians are. It's time that MDOT tell us don't you think and what they talked about. The DRIC project financing will be guaranteed in some way or be subsidized by the Governments or the P3s will not be involved. They will want their huge rates of return including fees for setting up a project, management fees, grossly excessive rates of return and so on. It is not a small project either. Considering the excessive amounts of money that we are talking about, it is gigantic. Imagine what this will cost us over the life of the P3 deal. I don’t think that my calculator has enough digits to figure out what the answer is. It is no wonder that apologists for P3s don’t want to talk about money. They would be laughed out of a room trying to put this kind of a proposition forward to a group of taxpayers who understood what was going on. We are given all of the nice information about parkland, tunnels and quality of life with the DRIC project to put us as taxpayers into a state of stupour. Mix in a bit of Canadian economic nationalism and pejorative terms like monopoly and private enterprise and you have a winner in this area. Why would anyone spend 10 times the cost of any other road in Ontario, or perhaps 20 times by the time this is done, just to build a DRIC road from Highway 401 to the bridge? Why are the Governments thinking at all about building a new crossing when in 1998 the Ambassador Bridge announced that it was going to build one? Why would the American Governments be interested in building a comparable plaza a mile down the road after they spent about $200 million on the Ambassador Gateway project which can handle twice the volume of traffic today without the need for new bridge. Why does Michigan want to give up billions in matching federal grants? It just does not make sense unless politicians and bureaucrats are P3 addicts. They been hooked on P3 money and they just cannot escape. Their brains have been fried. They need the money and they need it desperately. They do not care what it costs because after all the pocketbooks of taxpayers are unlimited. “Prime Minister Stephen Harper and country's premiers agreed Monday that investment in the country's infrastructure is the best and fastest way to use public funds to help Canada avoid the worst of a global economic recession. "We all agreed that we should see infrastructure spending accelerated," Harper said." Enough already, I need to sniff a $1,000 bill! I need my fix. It sure looks like the two leaders were practising their square dance for the TV program "Dancing with the Stars" in this photo! They were swinging their partner in the "doe-see-doe." If you want to see some real, nifty footwork, keep on reading below. 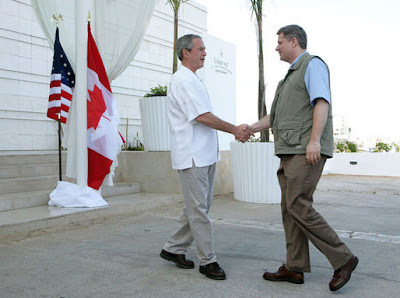 “Earlier in the day, Harper met U.S. President George W. Bush in a bilateral session. Harper and Bush spoke about the economic slump, the Detroit-Windsor bridge and Canada's concerns about new U.S. rules requiring meat and fresh produce to be labelled by country of origin, the Prime Minister's Office said. Obviously, this is a last ditch effort by the Government of Canada to try and get the American President to commit to the DRIC bridge before he leaves office. Prime Minister Harper is hoping that he can get some kind of a binding deal done that will force President–elect Obama to complete this transaction. Canada is obviously concerned that President Obama will seek to reopen the NAFTA agreement and may well use the bridge controversy as a bargaining chip. It may be our new Softwood lumber issue. There is terrific concern in Ottawa that President Obama will be extremely protectionist and that could hurt Canada’s economy. After all, the basis of Canada’s future is its Corridors and Gateways policy. Accordingly, Canada is desperate to have a deal done, and now, while the free trader President Bush is still in office. “Harper's comments corresponded with a decision by the assembled leaders to put off creating any new trade barriers for 12 months in the hopes of stimulating the world's shaky economy. "Removing protectionist barriers and easing trade restrictions was a big factor in ushering in this extraordinary era," said Harper, referring to recent years of unparalleled economic growth. "We cannot allow ourselves to turn back." Harper's comments fell in line with a joint statement from APEC leaders which called for freer trade as a way to solve the global financial mess. The statement from APEC members, who represent the majority of the world's economy, takes a previously-issued G20 statement a step further by imposing the year-long moratorium of trade tarrifs. The Prime Minister said Canada would use an approach he described as being made up of "sound foundations and open doors" to navigate its way through the current economic problems. Unfortunately, the Prime Minister has been poorly served again by the Canadian Embassy in Washington. I’m surprised in fact that the Canadian Ambassador, Michael Wilson, has not yet handed in his resignation after NAFTA-gate and the election of President Obama. This latest faux pas, talking about the DRIC bridge, can only help hurt relations between Canada and the United States even more. It is like rubbing Windsor salt into the new President’s wounds created by Canada before the election. 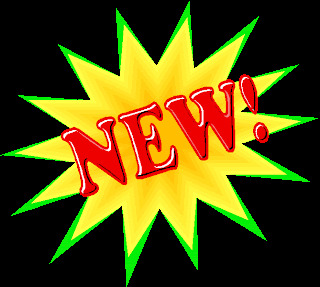 It is re-opening old sores which some had hoped were healed. As I am certain that you realize, everything that the US President says is taped for historical purposes. It becomes part of the US President’s library and, depending on the subject, can be released now or must wait a fixed number of years. How else to explain the big controversy over taking away the Blackberry from the new President. Prime Minister: Mr. President, I would like to raise one more time the issue of the DRIC bridge between Windsor, Ontario and Detroit, Michigan. After all, you owe me one. I did try very hard to slap down President-elect Obama with NAFTA-gate. I tried to help both Hillary and McCain. President: Yes, Prime Minister, but trying is not enough. McCain could have beaten Hillary easily. You knew that. You did not accomplish your objective. Obama, a Democrat, was elected. In the good old USA, we don’t pay people for failure except if you are in the financial industry. Or an executive in a Big Three auto company. President: Stephen, you tried that on me at the SPP conference and I said no. Then a few days later you had your Minister, Jimmy Prentice, try and embarrass me at the Council of the Americas with his speech. Did you like how I almost completely ignored Canada in my remarks. I thought the message I gave was clear. NO means NO. hehehe. President: Then you tried that leak with Radio Canada about a deal being signed in mid-July. You knew darn well that if I did something dumb like that I would get into all kinds of trouble with the US Environmental laws. What were you trying to do, get me impeached or something. Prime Minister: Mr. President, as you know Canada is very concerned because the Windsor/Detroit crossing is the most important one between our two countries. President: Save that talk for Windsorites whom you are trying to fool! We Texans like to get right to the point Stevie. Tell me if I have this right. You want me to support a Canadian initiative whereby the Government of Canada builds a new Canadian-owned, public bridge that links Canada and the US. You know darn well that we can’t afford to pay for our half since we are spending so much money to prop up the financial network of the world to prevent a Great Depression as well as fighting overseas to preserve freedom for the peoples of the Great Western Democracies. Prime Minister: We appreciate your sacrifices Mr. President. President: Hush now Steve. You’re interrupting me. You want your P3 buddies to build this bridge which you will control forever and they will manage for 99 years ripping off American citizens for huge amounts of money as they cross over the bridge to do commerce or as tourists to pay for this socialistic nonsense. You want these P3ers to have Americans put money in their pockets. Give me a break. You are trying to take advantage of my good nature. Prime Minister: But George, we are going to ripoff Canadians too. President: Not only that, you are trying to sucker Michigan into doing a P3 deal at Sarnia/Port Huron so your friends can control the Blue Water Bridge crossing as well and then you want your Mayor Buddy in Windsor to control the Detroit/Windsor Tunnel. Prime Minister: I would not put it exactly that way Mr. President. President: Well then how would you put it Stevie? As we say at the Peace Bridge: one good tern deserves another. Get the joke hehehe. You thought you would control that crossing too with shared border management huh! All the Customs facilities of both countries under YOUR control on YOUR side of the river. We saw through that when the DRTP suggested building a huge golf-course sized dual US/Canada Customs plaza in Windsor! If that is not trying to put the boots to the good old U S of A, then I don’t know what it is. The icing on the birthday cake as far as I am concerned was that you had the nerve to threaten me with oil and energy cutbacks at the SPP conference if I didn’t go along with you. Prime Minister: But George… you know I really didn’t mean it. Honest. I had my own election to fight and you know as well as I do that you have to bash Americans to win in this country. President: So you say mon ami! I learned that in French class in high school! I can see how hard you are sucking up to the new DEMOCRATIC President. Let me see if I understand this properly, Stevie… you want me to screw an American citizen who owns the Bridge now and who has spent his money to make this crossing the number one crossing in North America. You want me to help you take away what he and his family have built up through years of hard work so that he can sue my Government and yours accusing us of bad faith. You want me to go against what I have already said through my Department of State already when we would not give approval for the DRIC crossing before. And you want me to do all of this at a time when there is no economic necessity for it and when we Americans don’t have the money to do it. You want this so that you and your buddies can control the key border crossings into the United States and make a fortune at the same time with a P3 at the expense of Americans. Great legacy you are leaving me Mr. Prime Minister! As far as borders go, they do not call me George Dubai-U for nothing, chum. Prime Minister: errrrrrrrrr… Mr. President, can we change the subject and talk about cattle. President: Sure Mr. Prime Minister. I have a ranch in Texas with lots of cattle. I know bull when I see it! 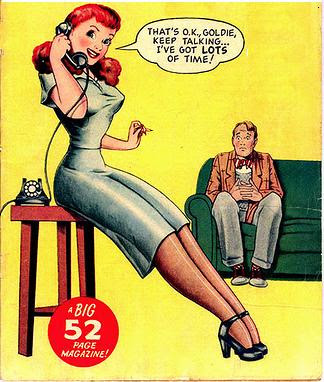 Talk quick now. President Obama only gave you 10 minutes on the phone. I am not giving you much more just because you are here in person! posted by JoeBlog at 10:20 a.m. I still remember my days with STOPDRTP. With a tiny fraction of the money that the City has spent in its advertising blitzes, probably less than the cost of a full page Greenlink advertisement in the Star, we were able to galvanize the community to put the brakes to that intrusive truck expressway through the heart of the City. That is why I am so surprised that the Mayor with his million-dollar advertising budget, the power of his position and with all of his media contacts has not been able to get the community on side to support what he's trying to do. It might be worthwhile in another BLOG to try and figure out why we succeeded and he did not. However there was a good clue in the Star coverage of Eddie's meeting on Saturday. OMG! A 2-hour Eddie Francis Greenlink presentation on a Saturday morning to work up the converted so that they will storm the DRIC meetings next week. How exhausting. I bet few of the citizens who came out expected to be harangued for that length of time. They came out strictly to find out how Greenlink was going to affect them as claimed by the Mayor and they will attend the DRIC open house to find out what DRIC has to say. It will be like the Schwartz and DRIC meetings before on the "areas of mass destruction"... if the maps do not show that homes will be adversely affected, people will go back to preparing for the holidays and forget all this stuff. That is the answer to the Councillor who always wondered why people did not get more involved in the full tunnelling debate. They just didn't care any more. residents must be willing to mobilize into neighborhood lobby groups. "has moved beyond merely signing a petition or passive support." Yes dammit...go out there and pretend that our Mayor has not failed. That is his "cause" cause he is desperate to get YOU, dear reader, to do his dirty work because he does not have the intestinal fortutude to do anything. I wonder if he has already been told he cannot do anything when in Dwight's car to the airport. No wonder he has dropped his sabre rattling and lawsuit threatening. Eddie is afraid to become the "bad guy" by suing and tries to induce the Bridge Company to be the one who will be vilified. He is saved if that happens. This time around he is trying with the silly games on the rewrite of the Community Improvement Plan report to target the Indian Road homes. I wonder how much of the $22,000 CAO approval contract extension that took up (RCI Consulting - amend contract amount - tasks Olde Sandwich Towne )! Does he not understand yet that the Bridge Company will do what they need to do when they want to do it and if they need to do anything. They are not reacting to his artificial time-table or that of the Senior Levels. That is why Henderson is in awe of them! They have not followed the script yet but are writing their own. I guess Eddie does not believe Dan Stamper when he said that the Bridge Company has the legal right to build their bridge. (Actually, he probably does because he knows Stamper does not bluff and that terrifies him. He is about the only person who ever scared Eddie into silence at Council!) Eddie's childishness will not deflect them from their path. In fact, after Eddie lost so pitifully at the Senate and in the Commons, he is viewed as irrelevant by most of the parties. "(Council) has asked me to pick up the phone, call David Estrin and tell him to hurry up his work," Francis said. "Council wants to know all their options from A to Z -- what are the benefits, pros and cons (and) what steps need to be taken. "The legal issues will be flushed out more and brought to council for Monday or soon after." The only thing beng flushed is taxpayer money down the drain. Hmmm, Did Eddie get a wrong number? It's November already. Mind you, Estrin did do something last quarter for which he billed over $300K! I wonder what that was for. Eddie knows that if he dares threaten a lawsuit, or heaven forbid actually start one, Pupatello's warning may come through. The Senior Levels will pack it in and EDDIE would be responsible for the loss of the project and the jobs. Then the finger would be pointed right at him. He could not hide because he is the Voice of Council. "What the province has just said is no new dollars until 2010. They just gave the feds five more years to do nothing. To me that makes no sense whatsoever." Ontario infrastructure minister David Caplan apologized Thursday for revealing a closed-door government decision to spend $500 million beyond 2010 for new infrastructure to fix Windsor's border problems. Caplan was on a plane Thursday headed for Vancouver to visit family, but his spokesman admitted the error. Wilson Lee said the minister's intention to reveal the funding commitment was done to show provincial government support for the city's $1-billion border traffic solution created by New York traffic expert Sam Schwartz. "We wanted to show a full commitment to the Schwartz Report," said Lee. "I suppose we should have held it back, but good news is good news at any time..."
Meanwhile, stakeholders in the border traffic debate levelled criticism at the province, questioning why the $500-million announcement for funding to alleviate local border traffic woes was not in writing, done with little fanfare and will not start flowing until after 2010. "(Caplan and Duncan) had no specifics on spending," said Ross Clarke, general manager for Mich-Can, a proposal to build a bridge off Ojibway Parkway. "They say it's available after 2010. Well, what kind of announcement is that? "It's political posturing. Show us the money and then we will believe it. I don't want to throw cold water on it, but I don't see a whole lot of hope in this." Did you notice the funny line about "full commitment" to Sam's concept? I can tell you what has happened between then and now. We have had stalling with the Schwartz report, stalling with full tunnelling, stalling with Greenlink and more stalling with Son of Greenlink and Saturday morning meetings. What's the purpose? "He said the "approval process is not ours but theirs" and, by their own guidelines, DRIC proponents within the provincial government must adhere to a timetable and process that means a final report cannot be presented to Cabinet until December and that must be followed by a Ministry of the Environment review that will take eight to 10 months. But it doesn't end there. He said those reviews could take "the most part of 2009" and, after that, the federal government would have to thoroughly vet the plan, potentially adding more months." My goodness... doesn't that bring us to 2010. What a remarkable coincidence don't you think. Just around the time that the Liberal Cabinet Ministers said that the Province would have some money but for the fact that Ontario is now a have-not province. But don't you worry, I'm sure that the P3 boys are out there right now beating the bushes to try and find money for infrastructure from the Sovereign Funds who would just love to be involved in a multibillion dollar Alpha infrastructure project in Ontario. I trust that you no longer listen to the "quality of life" nonsense that spews out of City Hall to try to oppose DRIC and to support Greenlink. As far as I am concerned, it is all a terrible charade designed to play on the emotions of Windsorites. Years of stalling by our Mayor when jobs are desperately needed here. $5M of taxpayer money already spent and more to come. I cannot explain it. There is more to this border file than meets the eye.